There are more than 90 community gardens in Los Angeles County. They showcase our diverse cultures and culinary traditions. Many are featured in LA Times' year-long series on community gardens. Due to our wonderful year-round gardening season, our gardens are very productive. To find a community garden near you, please go to the Los Angeles Community Garden Council's website, or email the LACGC Executive Director Julie Beals at jbeals.lacgc@gmail.com. 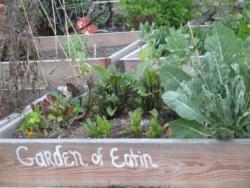 UC Cooperative Extension provides support for Los Angeles County community gardens through its Master Gardener Program. Master Gardeners volunteer at many area community gardens to train participants in sustainable gardening practices. For technical assistance from our Master Gardeners, please click here or contact Valerie Borel at vtborel@ucanr.edu, (626) 586-1986. If you are considering organizing a community garden in Los Angeles County, please first take a look at our Community Garden Start-up Guide (Spanish version). The guide outlines easy steps for developing a community garden and includes a sample garden contract. Several other organizations offer support for community gardeners. The Los Angeles Community Garden Council is an advocacy and networking organization for community gardeners. The Los Angeles Neighborhood Land Trust and the LA Conservation Corps are involved in securing land as well as organizing and constructing new community gardens. The American Community Gardening Association is a great resource for any community in the U.S. Eating the recommended number of servings of fruits and vegetables is critical to our health, as it reduces the risk of chronic diseases such as cardiovascular disease and some types of cancer. However, Americans are not eating nearly enough fruits and vegetables. Income is a factor. Residents of underserved urban neighborhoods often lack access to affordable, high-quality fruits and vegetables. As a result, they are less likely to eat the recommended number of servings. Gardening is one strategy for improving much-needed access to fresh produce. But, many Los Angeles County residents live in apartments or in home where they do not have space for gardening. Community gardens provide space by repurposing vacant land. Research suggests that community gardeners eat more servings of fruits and vegetables and a greater variety of vegetables than non-gardeners. Gardening is also good exercise, producing additional health benefits. Other possible benefits exist, beyond the potential for improving the health of participants. Community gardens help to build new community relationships, beautify vacant or blighted land, and create open space for urban neighborhoods that lack green space. Our newest publication, Community Gardens, is available online. To view the catalog listing of this title on UC ANR Catalog, click here.